Cesare Rubini, The Prince. Enough said. He hasn’t been just the Great Olimpia Milano’s legend; he has been a lot more. Rubini has been the greatest athlete ever if we can mix two sports completely different one from the other, basketball and waterpolo. A Trieste native, he was brought in Milano to launch Adolfo Bogoncelli’s team, the one which should have been symbol of “triestinità”. Then the Triestina team became Olimpia merging with Borletti and he became the icon, beyond being as a fact the first professional player in the history of Italian basketball. To understand which kind of player he was: he conquered the silver medal at the European Championshipa in 1946 and the gold medal in 1947, but the last one in waterpolo! He was an extraordinary athlete, a team-player, a hard-nosed guy, a defensive stopper. In 1948 he turned down the opportunity to play basketball at the London Olympics to win the gold in waterpolo. In 1952 he won the bronze medal at Helsinki, conquering a spot in the waterpolo Hall of Fame, an honor he was awarded in basketball too. In 1947 he became Olimpia’s player-coach, in 1950 he won his first Italian title as a coach (and he was still playing) and didn’t stop until 1954. In 1957 he quit playing and kept coaching, while his charisma extended through at least two or three different eras, given that his last win was the 1972 Cup of the Cups. He was also the first Italian coach to win the Champions Cup with an Italian team, in 1966, and he also coached a generations of stars showing his talent in recognizing talent and in the handling of it. Among the Americans, many are worthy of mentions but mostly Bill Bradley, Skip Thoren and Art Kenney. He was a genius in creating coaches too. 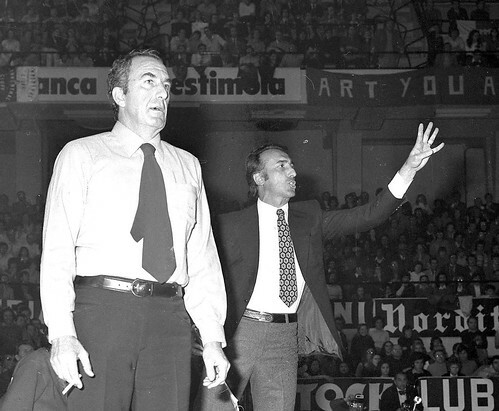 Under his wing, Sandro Gamba was promoted, becoming his first lieutenant as a player and then assistant coach, but also Dido Guerrieri (and Pippo Faina who was responsible for bringing in Milano Mike D’Antoni, or Bruno Arrigoni, Toni Cappellari who experienced more success as managers). With Gamba, he formed a “team” that experienced great success also with the Italian national team, winning the Olympics silver medal in 1980 and the gold at the European Championships in 1983.